Innovative CDR Foodlab® Method, fast, user-friendly and realiable simplifies the standard AOCS (Cd 18-90) procedure since permit to test micro-quantities of samples (melted fats or oil as it is) without any treatment in just 2 minutes without toxic reagents, dedicated instrumentation or skilled operator. Testing time: one test 2 minute – 40 Tests/hour. CDR FoodLab® method shows a good correlation with AOCS Official Method Cd 18-90. 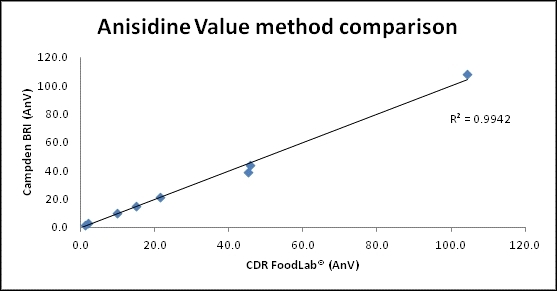 Furthemore Anisidine Value was determined by Campden BRI laboratory using the CDR FoodLab® instrument and the laboratory method Campden BRI Method TES-AC-360: the correlation, R2, was found to be 0.9942 which indicated very good correlation. Anisidine value test is used to assess the secondary oxidation of oil or fat, which is mainly imputable to aldehydes and ketones, and is therefore able to tell the oxidation “history” of an oil or a fat. Oil as is (extracted from dry fruits, seeds, nuts, etc.). Anisidine Value (AnV) was last modified: February 8th, 2019 by CDR s.r.l.